If you’re like most serious players, you have no doubt realized that there is no substitute, tonally, for having separate dedicated rigs and setups to achieve different sounds. Players such as Eric Johnson and Joe Bonnamassa have shown how having separate amp rigs can give them much more versatility than a simple channel-switching amp, without the tonal compromises that might come from, say, a modeling amp. Once you start amassing multiple amps and guitars, the challenge then becomes one of, how do I combine all of this together so that I can tap into the versatility without having to constantly plug and unplug setups? Perhaps you’ve already started down the path of having multiple A/B boxes to switch different guitars into different amp rigs. There are more elegant solutions to be had, and Radial Engineering, who has earned a reputation for making some amazingly well thought-out designs for touring and studio professionals, have come up with a solution to your multi-guitar/multi-rig setup: the JX44. More than just a rack device for switching guitars and amps, this studio-grade and tour-worthy box includes other features from essential Radial products for studio re-amping, driving long cable runs to pedal boards and more. It’s a unique box with a ton of applications either in the studio or the touring rig, and with typical Radial audio specs and rugged construction behind it, this is one box that is a no-brainer to recommend for a variety of tasks. 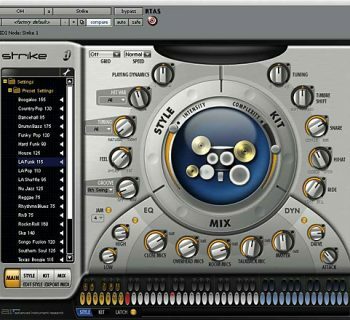 The Radial JX44 is a feature-packed device well suited to both the stage and studio environments. From multiple guitars to multiple amps to distant pedalboards across an arena stage to re-amping your guitar in the studio, the JX44 has you covered. The JX44 lets you connect up to four guitars, basses, or other stringed instruments at the same time, though only a single instrument input is active at one time. All four connections are made on the rear of the unit, but the first two inputs also have secondary input jacks located on the face of the unit, and these take priority automatically. If you had wireless units in your rig plugged into the rear of the JX44 and wanted to simply plug a guitar into the front with a cable to check something out, or for work in the studio, this design approach makes obvious sense. The first two inputs, A and B, also have a Drag Control knob that provides a load compensation feature to simulate the performance characteristic of plugging your guitar directly into an amplifier, unlike the technically “perfect” electrical signal sent by the JX44 to your amp. Inputs C and D lack the drag control feature, but gain input trim controls, which makes it easy to balance levels between instruments with active vs. passive electronics, or between an acoustic guitar’s pickup output and your other guitars, etc. A dedicated JR-5 remote footswitch (optional) lets you select instrument inputs on the fly. This is great for keeping a few instruments always hooked up and ready to play, and for an artist on tour, it makes it simple for your tech to hand you a new guitar from one song to the next and make the selection off-stage for you. The footswitch relies on a balanced XLR cable and can easily run 100 meters (328 feet). The JX44 also features a dedicated tuner output and mute control via any standard footswitch. Whether you’re a go-to studio session guy or an obsessive MusicPlayers.com gear junkie on tour, who wouldn’t want to have a Fender Twin, Vox AC-30, Mesa/Boogie Dual Rectifier, and Marshall JCM instantly on tap? Sure, you can insert your own favorite amps into the list, but if you want to switch amps instantly, even within a song, the JX44 has you covered. Want to play through multiple amps at the same time? No problem. You can have your L.A. sound as the JX44 gives you the option of amp switching or layering a combination of amps at the press of a single footswitch. Speaking of footswitches, amp selection is controlled via a second, identical JR-5 footswitch. Many times, we’ve seen players have a tech off stage using one switch to select guitars, but the artist has the amp selection footswitch on their pedalboard. The first thing we noticed about the JX44 upon unboxing it was the weight, and this is attributable not only to the rugged steel construction but also to the isolated transformers for handling the multiple-amp scenario properly. Each amp input has controls for 180-degree phase reversal, a ground lift, and inclusion/bypass of the onboard effects loop. As if this isn’t enough, while outputs 1 and 2 have single outputs, outputs 3 and 4 each feature dual outputs, so they can drive two amps apiece (or both sides of a stereo power amp, though in a dual-mono configuration). A mono effects loop is present on the JX44, buffered, and assignable to individual amps. This feature makes it easy to share your front-of-amp effects with multiple amps. When you hit the arena, your pedalboard may need to be far away from your rig, and a 25-foot cable just won’t cut it. Also built into the JX44 is Radial’s SGI technology. With an optional SGI-44 box installed on your pedalboard, you can run a 100 meter-long balanced (mic) cable between your board and the JX44, which provides a significantly quieter and better-sounding signal than trying to run a standard audio cable over that great distance. The JX44 has a balanced DI built in. It features 180-degree polarity reversal, a ground lift, selectable use of the effects loop, and it can either be assigned to all guitar inputs for re-amping in the studio (for example, tracking your clean signal for use with amp modeling plug-ins), or assigned specifically to input D for use only with an acoustic guitar. When it’s time to actually re-amp your dry guitar signal from a digital audio workstation (DAW), Radial has built their X-Amp product into the JX44. Simply run an output from your DAW into the RX input and it can be routed to any/all of your amps. The JX44 provides multiple features well suited to a variety of applications, and it does a remarkable job of delivering all of this functionality quite easily. We tested the JX44 in a variety of settings both for live use as well as recording in the studio and constantly came away impressed. In one case, we had a session where we were juggling multiple guitars into different amps for a variety of guitar overdubs. We were using a Gibson Les Paul into a Marshall head and closed-back 412 cabinet for big dirty rhythm sounds in the song’s chorus, and then a Fender Stratocaster into a Divided by 13 head driving an open-back 212 cabinet for chimey, cleaner sounds during the verses. For solos, we ran a Tyler super-Strat into a large Wet/Dry/Wet rig for that immense, million-dollar studio tone. The JX44 made it simple to switch between one dedicated rig and another, and it also made life very easy when we wanted to go between one guitar and another amp combination without having to constantly re-patch things. Hooking everything up was simple. Each guitar was plugged into the instrument inputs on the back with standard instrument cables, and we went from the JX44 to the amps by using standard instrument cables from the amplifier outputs on the back of the unit. Note that adding cable length to any equation will change your tone slightly, so if you are used to using twenty feet of cable between the guitar and amp, in order to preserve the sonic quality you are used to, try using two ten-foot cables as a substitute (or look into using a buffer for longer cable runs). In another session, we used the JX44 for tracking bass guitar in the studio. 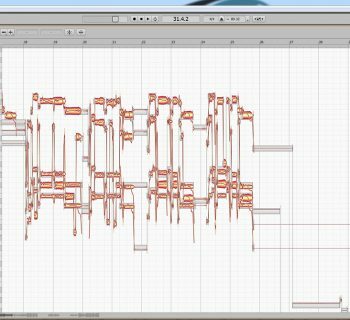 With a bass plugged into the first input, we sent one output to the player’s bass amp, which was miked and recorded to one track in our DAW. With the JX44 we concurrently recorded its DI output to a second track so that we could make use of the unprocessed direct bass sound. As if that wasn’t enough, we were also able to take the bass amp’s post-EQ DI output and run that to another track, offering our bassist (and mix engineer) a ton of flexibility for building the best bass tone for the songs being tracked. The JX44 is one of those units that, while geared towards the professional player, has numerous applications for the hobbyist or other serious musicians. And it should be a mainstay in every recording studio. Sound quality was very good. As we mentioned above, nothing is ever truly transparent, because every time the amount or length of cable is changed, the tone is impacted. However, we didn’t find that the JX44 adversely affected the tone on its own. In fact, when we substituted two ten-foot cables (one into the JX44 and one from the JX44 to our amp) for our typical twenty-foot cable, the tonal quality was identical. We found the JX44 to be acceptably quiet for studio use, and subsequently fine for live use. It is truly a godsend to players who are using multiple guitars and amps and perhaps the first off-the-shelf unit we have found which addresses this need. The JX44 includes very good documentation, easy to read and filled with numerous examples of how to integrate the device into various live or studio settings. Additional information is readily found on the Radial Engineering website. The Radial JX44 (MSRP $1,650) typically sells for around $1,500, and the optional JR-5 footswitches (MRSP $275) sell for $250 apiece. 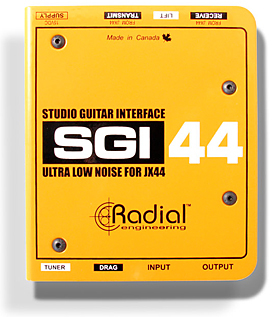 An SGI-44 (MSRP $375) can be ordered directly from Radial Engineering. The JX44 certainly isn’t a cheap unit, but there are few units that do what it does save for a handful of custom, build-to-order products. Given the deep functionality and the well-thought-out features of this unit, we think this is a good value for a unit that allows the multi-amp and multi-guitar player to efficiently manage a complex rig. The only items that come to mind that compare directly with the JX44 are a few custom units produced by rig builders. There are no commercially available products, to the best of our knowledge, that offer the combination of features that the JX44 provides.